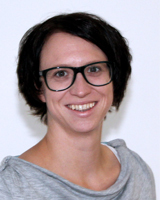 Sandra Pfleger works as a communications & project manager at the evolaris next level center of excellence in Graz. She holds a degree in digital media & intercultural communications from the Paris-Lodron University Salzburg. Before joining evolaris in 2013 she was working for the EU Agency EIGE (European Institute for Gender Equality) and the anti-discrimination office of the Federal State Government of Styria. Prior to entering the labour market Sandra was active as a volunteer in development co-operations in Khayelitsha, South Africa.